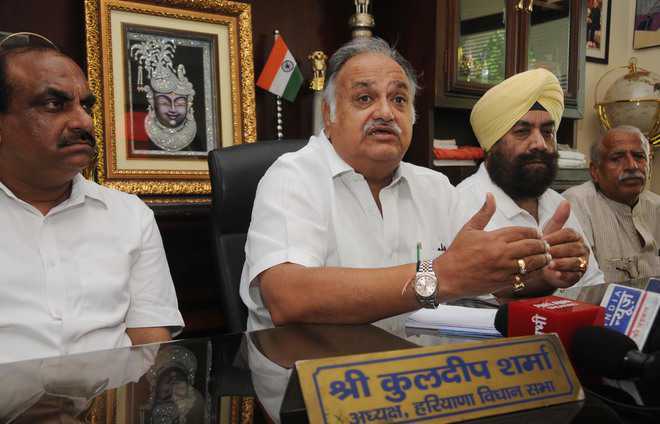 Ganaur MLA Kuldeep Sharma on Friday blamed Assembly Speaker Kanwar Pal Gujjar for suspending Congress MLA Karan Dalal from the House for a year, terming it to be an “unconstitutional step”. In the recently concluded monsoon session of the Assembly, Dalal and Leader of the Opposition Abhay Chautala brandished shoes at each other. The intervention by Congress and INLD MLAs, however, calmed the two leaders down. But the episode ended with Dalal’s suspension. Sharma demanded CCTV footage of the episode be made public so that the people could know who was at fault. “The Speaker acted under pressure from the state government and the INLD,” the former Assembly speaker told the media at his house here. He questioned the year-long suspension of Dalal. “As per rules, an MLA can be suspended only for a session, not for a year. The Speaker took an unconstitutional step. “The Congress wanted to flag illegal mining in Jagadhri, the Speaker’s constituency, in the monsoon session. Dalal’s suspension was a ploy to stop the Congress from raising the matter,” he claimed.